← Raspberry Lindor Balls, have you tried these? Sure…Valentines day is about love, and your sweetie, but it should also just be about you and your love of sweets. 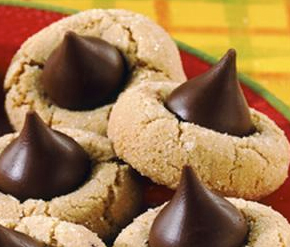 These cookies are hard to beat, and are sooo easy. It’s surprising that I don’t see them more often. Bring a plate of these to the office or to a potluck, and you’ll be the belle (or whatever is the male equivalent) of the ball. I have made all of the versions of these, from the recipe that uses Bisquick and condensed milk (not good) , to the one that just used flour sugar and peanut butter (yuk). This recipe below is the one that my family likes best, I have tweaked a few things so they are the way I like them. You can make a whole batch in a little more than 1 hour. 2. In the bowl of a stand mixer, cream together butter, both sugars and peanut butter. 3. Combine flour, baking soda and salt in a small bowl. Add flour mix to butter mix. 4. Refrigerate dough in bowl for 30 minutes. Unwrap the kisses while dough is chilling. 5. Form into 1 inch balls. Roll in white sugar, and place them 2 inches apart on a cookie sheet. 6. Bake for 9 to 10 minutes, or until cookies are just a little brown. Remove from oven, and press a Kiss into each cookie.Cool on cookie sheet for 5 minutes and then move cookies to cooling racks. *Updated note: If you want the cookies to be chewier, decrease the flour by 1/4 cup. Thanks to Hershey for the photo. Posted in Cookies, Milk chocolate, Peanut Butter and tagged hershey kisses, peanut butter. Bookmark the permalink. O these are most yummy…I had forgotten about them. Thank you for the sweet reminder! Can you make them ahead and freeze them? Thanks for asking. I think that they could be frozen, however the chocolate will have a grey tone with the “bloom” that occurs when it’s frozen.